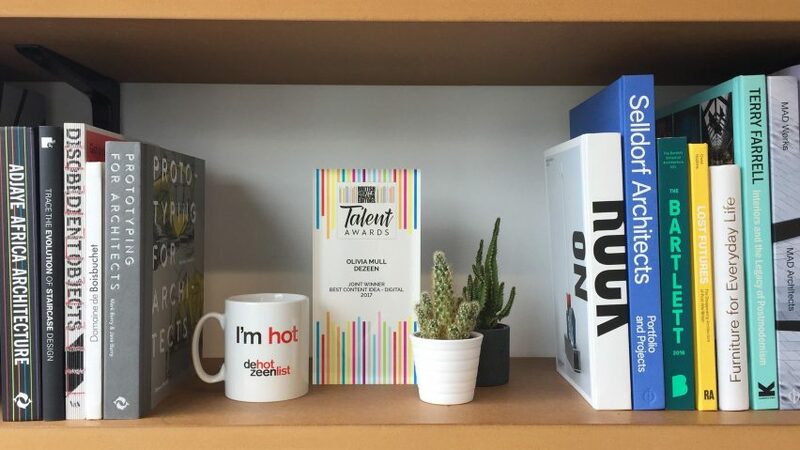 Dezeen's managing editor Olivia Mull has picked up a prestigious industry award for Dezeen Hot List, which was named Best Content Idea – Digital at the BSME Talent Awards 2017. Described by judges as "a game changer in its market", the inaugural Dezeen Hot List is the first data-driven power list of global architecture and design. It was named joint winner in its category at the BSME Talent Awards, along with lifestyle magazine Good to Know. It saw off tough competition from major UK publications including Time Out, Grazia, Marketing Week and The Debrief. "Its execution was new and very effective – in fact a game changer in its market," said judges. "Using audience data to inform its creation, crunching site search returns and page views layered with other metrics, this brand launched a microsite that generated almost 400,000 page views in three months and grew unique visitors by 11 per cent to over 20 million." "This outstanding project was executed by 14 writers, researchers, developers and designers – all led by one woman with one vision," they added. Mull, 24, joined Dezeen in 2014. As managing editor, she manages Dezeen's editorial team and also leads all special editorial projects, including Dezeen Hot List. Dezeen Hot List launched in November 2016, offering a comprehensive guide to the architects, designers and brands that are most popular with our audience. Based entirely on data, it revealed the key players and emerging talents in the design world. The award was announced at an event in London's Shoreditch on 6 June 2017. It is the first in a series of awards events that BSME – the British Society of Magazine Editors – hosts every year. But it is not the only award Dezeen is in the running for in 2017 – we are also shortlisted in six categories at the Association of Online Publishers' annual awards, giving us more nominations than any other publishing company. Two of the six nominations are for Dezeen Hot List. The project is up for both Best Digital Publishing Launch and Best Research/Insight Project, which celebrates innovative and effective use of research.